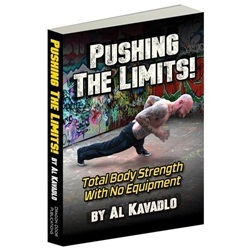 The Pushing The Limits Book by Al Kavadlo is one of the best functional strength and fitness books released in 2013. Al Kavadlo has published a number of books on functional strength and body weight training. His Pushing the Limits book is one of his most recent publications. Al Kavadlo is a Certified Strength and Conditioning Specialist (CSCS) and is touted as one of the world’s leading experts on body weight training and functional Calisthenics. I am a huge fan of Al’s work as I believe that the development of “real world”, functional strength is the best way to prepare the body for any physical challenge! Al’s books also highlight the benefits of training using nothing but body weight. This is great because Calisthenics (Body Weight Training) is often looked at by modern athletes as an effective method of developing strength and power. Let’s dive in and take a look at Al’s Pushing the Limits book. Pushing The Limits….whats in it? I have always been a huge fan of Calisthenics, Isometrics, and Plyometrics. I believe that exercises that develop true “functional strength” are whats missing in the majority of peoples training routines. The beauty of this book is that it shows you how to develop huge levels of strength by showing you what the human body is capable….and its really quite amazing. It also shows you how training like this will force your body to adapt. This process sheds excess body fat, leaving you with nothing but lean hard muscle. I have seen plenty of guys “strutting” around the gym showing of their “mirror muscles” but I have seen very few of them jump up on a horizontal bar and knock out a stack of pull ups….let alone muscle ups! Their level of functional strength is therefore likely to be pretty low. Sure, they aren’t couch potatoes but they probably can’t do free standing handstand push ups. In other words, their muscular and defined physique is next to useless in the real world. Al is a product of what he preaches – and the 1st thing you will notice about his physique is that he looks very athletic. He has well defined, lean hard muscle on his slight frame and looks (and is) incredibly agile. To show you what I mean, check out the video below showing Al showcasing some of his moves. My favorite aspect about Pushing The Limits is that it provides a series of strategic progressions. This is so you can progress at your own pace and ensures that you don’t push your body and your joints to far to so. This helps to prevent injuries that will set you back. This means that whether you are an absolute beginner or a seasoned pro, you are bound to achieve the results you are after by following Al’s advice. Al also includes some advanced variations to some common exercises. Regular push ups become Plyo push ups or handstand push ups! Pull ups progress to muscle ups. You get the drift. As with Al’s other book Raising the Bar, I felt that the “why” aspect is missing from this book. I like to know “why” I’m training a certain way. What are the benefits of training this way that are not strength related i.e. does it reduce injury etc. What is the history of Calisthenics? You get the idea. I’m always trying to learn more and so these details are important to me. In this area, the book doesn’t deliver. If you are like me and want to know the why, you will definitely want to check out Convict Conditioning by Paul “Coach” Wade. That’s not to say you shouldn’t get Pushing the Limits….far from it in fact. It’s still a great book and having multiple training resources is never going to be a bad thing! Pushing the Limits has some really terrific body weight exercises and routines in it. It would have to be one of the most complete guides to Calisthenics training. The progressions are absolute gold, especially if you are new to Calisthenics. The book is the a great complement to his other book Raising the Bar. Even if you are an advanced level athlete you can reap many benefits from the advanced Calisthenics in this program. So…if you want the knowledge of how to build crazy levels of strength while sculpting a chiseled physique, this book will deliver results…just add time and effort. The ball is in your court. Stay up to date with whats happening at Strength & Stability by signing up to our newsletter below.